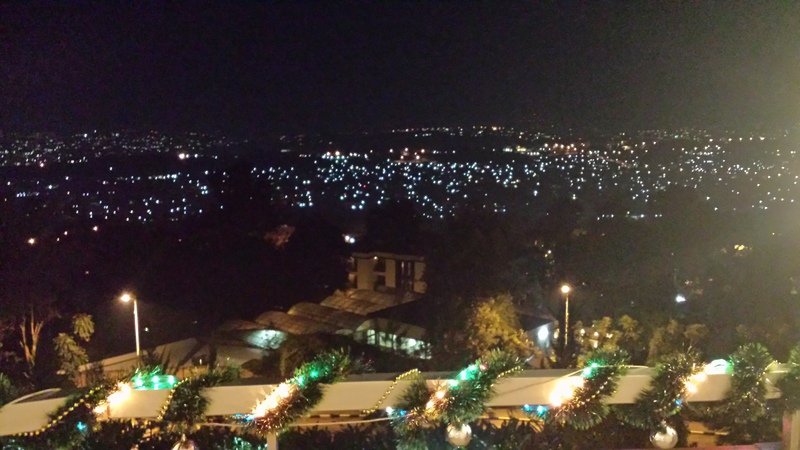 Kilgali from the Hotel Mille Collines (Hotel Rwanda) tonight. This morning I went to the airport to collect my luggage. I had a gut feeling that it would not be delivered to my hotel as promised. How right I was. My case was left sitting amidst a pile of other items of luggage. It was a morning where I learnt about the importance of trusting ones gut or relying on providence, karma or whatever you like to call it. I know what I call it and so too does John Bosco. The plan for the group today was to visit some of the sites that are associated with John Bosco’s struggle for survival. He left Rwanda with his wife Christine and his family in the year 2000. Much has changed since then. The population of Kigali at the time of the genocide was approximately two hundred thousand people, now it is estimated to stand at over a million people. 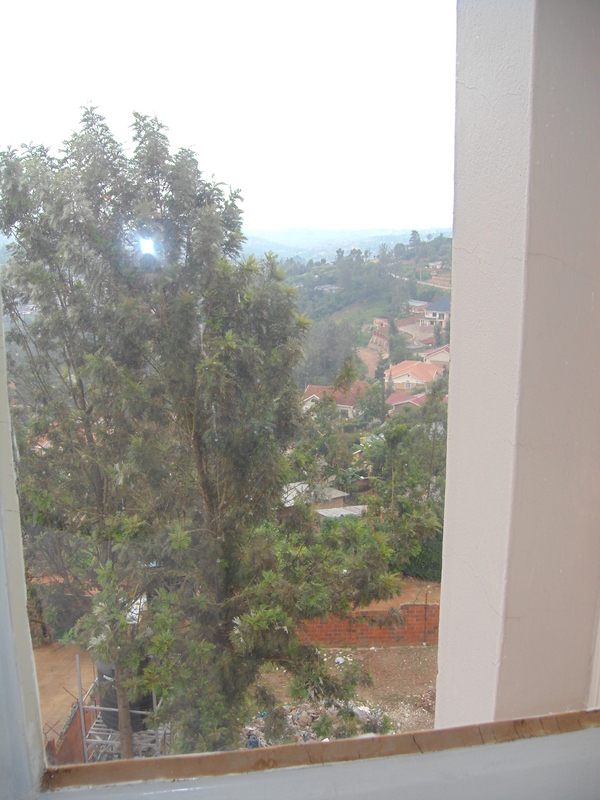 For John Bosco and Christine much has changed in Kigali. They were concerned that some of the buildings that are important in their journey may have been knocked down. These buildings included his old home, Christine’s home and the Swiss Village. At the time of the genocide Christine worked for a project sponsored by the Swiss Government which involved forestry and agriculture projects. The Swiss Village was also known as The Swiss Ghetto and it housed Swiss people involved in the various projects. It was not far from John Bosco’s home. When the genocide began it wasn’t long before government soldiers appeared at his house. The soldiers worked hand in hand with the militia. John Bosco was taken to his back yard with his relatives and where was certain that he would be killed by the soldiers who had come to his house. When they took their eye off him he jumped the fence leaving the rest of his family in the garden. The purpose of this ‘gut’ initiative was to talk to his neighbour; an elderly lady and a Hutu. She called a neighbour three doors up who was a Captain in the army and shortly after this the captain’s body guard appeared; he paid off the soldiers with John Bosco’s money and told them to ‘get out of here’. But where could you go; soldiers and militia were everywhere. Christine’s boss has said to her that if things got dangerous they could use the Swiss Village. You see, there was a sense in the air that trouble was brewing. Embassies had emptied; the international community literally abandoning the people of Rwanda. John Bosco made his way to the Village. He was given the use of an apartment where he and family hid along with many other Tutsis. He hid the younger members of his family in a press where they slept. However two days later the morning of Sunday April the 13th he awoke to see an army of militia ‘like red ants’ approaching the village. Everyone knew what was happening and they all ran; people were climbing walls’ jumping over hedges; all trying to find a palce to escape to. The militia pursued everyone and the shots that rang out were accompanied by screams. When John Bosco ran he realised his sister Julienne was missing; he ran back and realised after finding her that they were only seconds away from death. If he left the courtyard where he had found Julienne they would certainly meet the militia and both would be killed. He decided to jump up on the roof getting Julienne to find a chair that she could stand on so he could pull her up to the ‘hope’ of safety. Again fortune kicked in; the roof was designed like a Swiss ski chalet and unlike Rwandan houses they had hidden gulleies. If this was a standard Rwandan roof there would have been no place to hide. From the spot on the roof they could hear people being interrogated, being shot and some being hacked to death. They lay on the roof for over twenty four hours, terrified. This morning I accompanied John Bosco and his wife to this place that holds horrific memories. 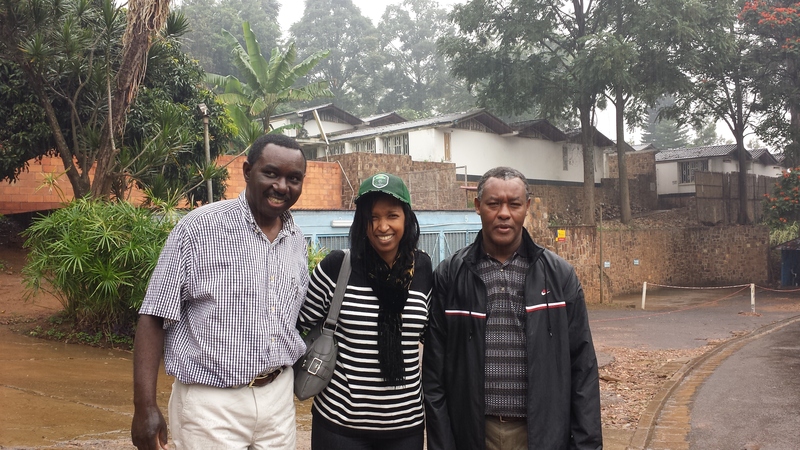 In the company of his friend Felicien who they met at the infamous Hotel Rwanda and Fr. Daniel Groody we watched as he recalled those dark yet days that shot out beams of light for him. When we returned with the larger group in the afternoon I helped him onto the roof. The two of us sat in the spot where he had hidden with his sister. He said that he felt secure on the roof that somehow an overpowering sense of the presence of God assured him that all would be well despite his fear. Shots rang out all around and death was in the air in the midst of these thoughts. We visit the Valley of Death in a few days; the gulley on that roof John Bosco now calls the ‘Valley of Life’. John Bosco, Christine and Felicien in front of The Swiss Village. You can see the gulleys in the building behind them in which John Bosco hid with his sister. Despite all the sacramental preparations and carefully executed liturgies, God’s presence is most powerfully felt in anguish. Polite theologies often exclude the dimension of human struggle and human energy that leaves itself open to grace. This level of divine engagement was witnessed most powerfully on the cross and continues to be seen alive in stores such as John Bosco’s and Christines. Tonight we were brought for dinner to the Hotel Mille Collines; the hotel that was featured in Hotel Rwanda. We had dinner with three people; John Bosco, Christine and Felicien. John Bosco spent forty four days in the hotel during the genocide and Christine forty days. The irony of enjoying a meal in the same place with three people who close to twenty years were surviving daily on bags of rice and water from the swimming pool during those days of uncertainty. John Bosco thanked God at the end of the meal for allowing him to live and share his life with Christine and for so many people who have become family to him over the years to replace all those who were murdered. Felicine spoke of the journey beyond guilt that he had to make and the realisation that it is not tolerance that builds societies but acceptance which is founded on love. If they held onto their anger or their annoyance at past events they know they couldn’t live as they do today…they live lives that are lived for others. 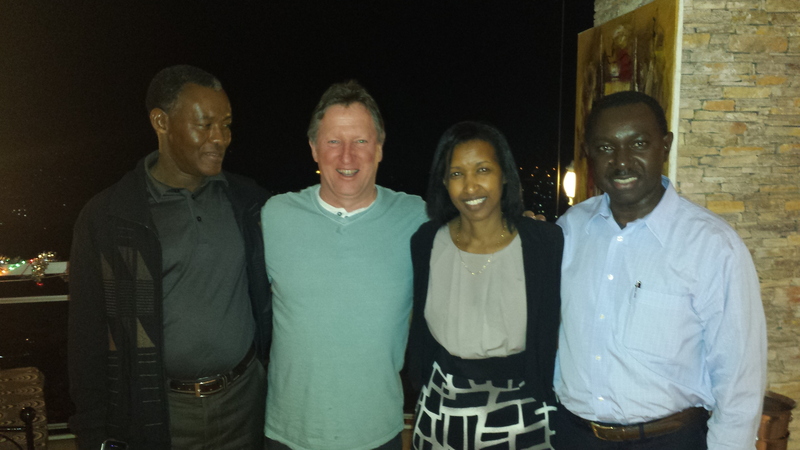 Dinner in Hotel Mille Collines, (Hotel Rwanda) with Felicien, Christine and John Bosco. They were refugees in this hotel in the height of the genocide.